The Pre-stressing and Pre-casting of concrete are inter-related features of the modern building industry. Pre-stressing concrete is the application of compressive force to concrete members and may be achieved by either Pre-tensioning high tensile steel strands before the concrete has set, or by the Post-tensioning the strands after the concrete has set. Pre-stressing of concrete is defined as the application of compressive stresses to concrete members. Those zones of the member ultimately required to carry tensile stresses under working load conditions are given an initial compressive stress before the application of working loads so that the tensile stress developed by these working loads are balanced by induced compressive strength. Pre-stress can be applied in two ways. 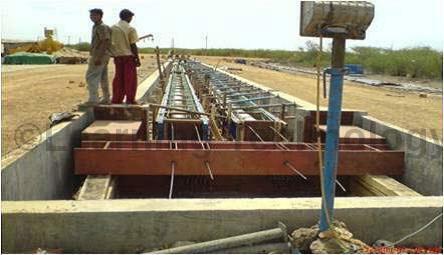 Pre-tensioning is the application, before casting, of a tensile force to high tensile steel tendons around which the concrete is to be cast. When the placed concrete has developed sufficient compressive strength a compressive force is imparted to it by releasing the tendons, so that the concrete member is in a permanent state of pre-stress. Post-tensioning is a method of reinforcing concrete or other materials with high strength steel strands or bars, typically referred to as tendons. Post-tensioning applications include office and apartment buildings, parking structures, bridges, stadiums, soil anchors and water tanks. 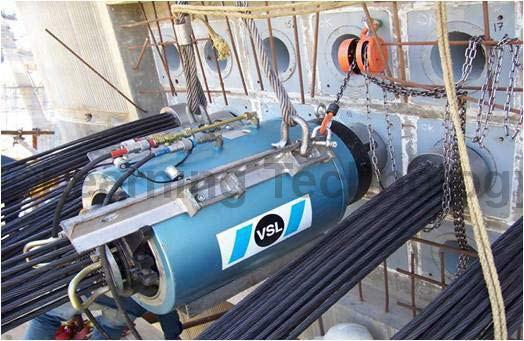 Post–tensioning is the application of a compressive force to the concrete at some point in time after casting. When the concrete has gained strength a state of Pre-stress is induced by tensioning steel tendons passed through ducts cast in to the concrete, and locking the stressed tendons with mechanical anchors. The tendons are then normally grouted in place. Allows greater degree of loading than any structural material. Lighter elements permit the use of longer span. Ability to control deflection in beams and slab. Permits efficient usage of steel and reduces cost. Building frames and floor slabs.